Due to a terribly unfortunate glitch, we lost the main portion of this episode, where we discussed the movie The Postman, in a new segment To The Death! - where we review a film that one of us absolutely loves, but the other absolutely hates. Jarman is in love with The Postman even though it is pretty universally reviled. But, as mentioned, we lost that whole segment due to a strange computer glitch. 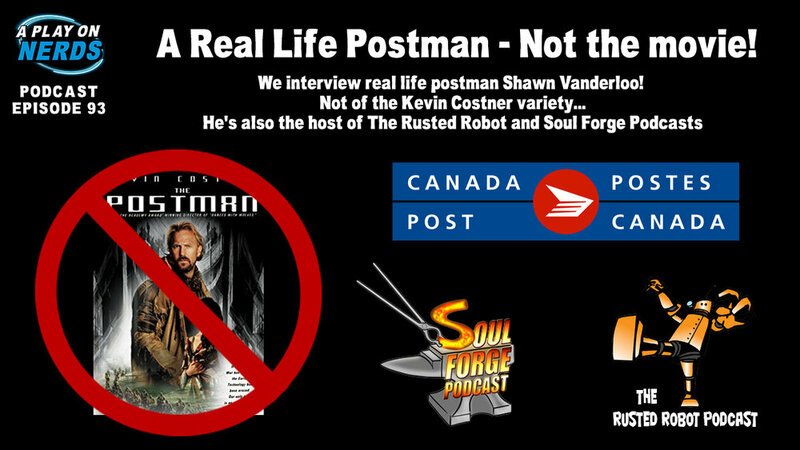 What did survive the terrible glitch was our related interview with Shawn Vanderloo, who is a real life "postman" in Canada. He tells us all about the ups and downs of his job as a letter carrier. It's a super fun romp! And you may already know Shawn as he a host on both The Rusted Robot Podcast and the Soul Forge Podcast. You should definitely check them out! Sorry for the loss of what was a hilarious episode, but we'll be back with you in another full episode of A Play On Nerds in a couple weeks. We're moving into a brand new studio space, so it will take a bit of time to get set up. See you then!